On 1st July 2005, four surveillance cameras started monitoring an area around the small village of Wylatowo, in the south-west of Poland. This area is well-known by famous crop circle figures. A serious group of crop circle investigators are hoping to film the laying of crop circles by the unknown intelligence. One month a year, the crop fields at Wylatowo are under 24 hours surveillance. So, as a crop circle investigator and member of the Dutch Centre for Crop Circle Research (DCCCS), I also started watching the online cameras, not 24 hours a day, but now and then. 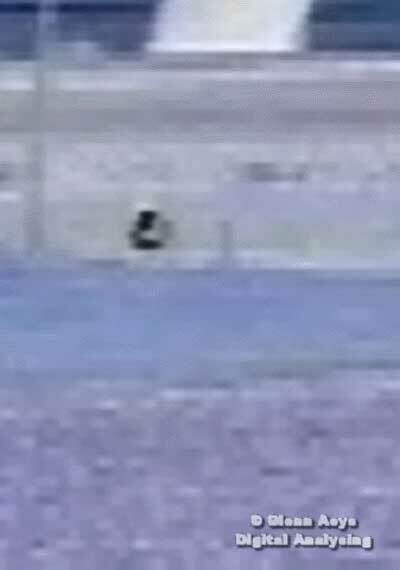 It all started getting interesting when I read an interview with Mike Booth about his strange meeting in a crop field in England with three unknown objects hovering in the tops of the crop in broad daylight. 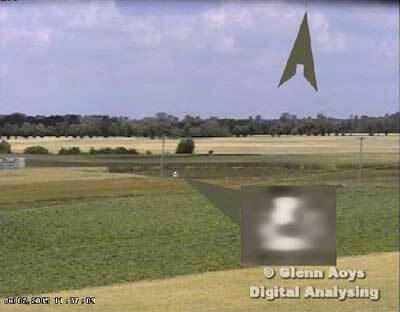 I thought that perhaps it would be possible to see something like that on the Wylatowo webcams. I discovered that by visiting the website - http://www.raportx.pl/kamery.html - of the Polish investigating team, a DVR webviewer program became automatically installed on my PC. With that program it is possible to store the film files on your own hard disk. So, if not looking at the online cameras, the films can be viewed at another date and time. I decided to store some of the film files from the 1st until the 4th July 2005. The first time that I looked at the films was Saturday 4th July. It was raining in the Netherlands and so this was a perfect day to spend some time on the films. There were four cameras and it was quite boring to look at films where one only could see crop fields and now and then some insects on the camera lenses. But something in my mind said “keep looking”. Then, on a tape from 2nd July, I saw something with a white colour flying over the crop field, which was gone in three seconds, in the blink of an eye. At first I paid little attention to it, but on the following Sunday, I looked again and again. I discovered that I could play the film in slow motion and then it became more and more interesting. I saw, as I first thought, one object on five frames. It was shape-shifting and it had a white colour, becoming almost invisible at times. I was realising that we were dealing with an unknown object, so I warned the Polish investigating team, but emails were unanswered, maybe because of the busy crop circle season in Poland. So I started to save the five frames, and by blowing up the unknown object with professional software, the details became more visible. Weeks later I also noticed an object in the sky, and after a month I found the same object on camera No.2. The images show the movement and development of the objects (some of the close-up images are shown in negative to make things clearer). 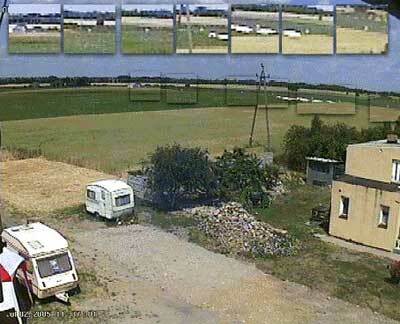 The first five images are from camera 1, and the sixth montaged image shows the view from camera 2. The sighting begins from left to right. Also, an unknown object in the air became visible (Fig.1). This is the beginning of the sighting - a faint object in the air becomes visible. One of my conclusions by analysing the object is that we are dealing with the famous crop circle Balls Of Light (BOLs). It is not really one object, but in fact seems to be a cluster of four to a maximum of seven BOLs. It is easier this way to understand the easy way it changes form, an ability that the unknown object seems to possess. 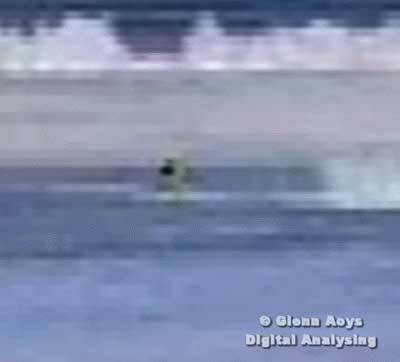 The first shot of the object shows it has a strange stretched form. 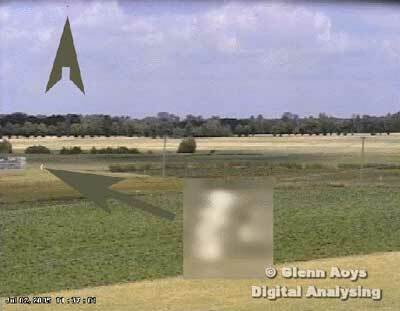 The arrows I have added to the images point to the object in the air and above the field. Time and date are visible, even the seconds. It is possible that we are looking at four separate BOLs on top of each other. When the object is seen in negative, its borders are more visible. Within three seconds the form has changed. Also, a kind of mist appears, and it seems almost as if it is becoming invisible. The stretched form has vanished, and only one BOL from the original four remains. Analysed in negative, we also see a strange brown hazy, misty substance (Fig.2). Is this what is left over from the rest of the BOLs from vanishing into another dimension? Five seconds later, again we look at another form and the object in the air is again visible (Fig.3). The object seems more white. We see two BOLs on top and one below, with a small faint connection between (Fig.4). Four seconds later, we find one of the most spectacular images (Fig.5)! We see a colour change and movement. There seem to be two BOLs below, one moving to the right, the other moving to the left. They leave a small trail behind, just like a comet! Again, in negative the tails are very visible. Six seconds later, as the objects pass almost out of reach of camera 1, three more BOLs become visible under and at the right of the object, making a total of seven visible BOLs. Fig.6 shows a montage of the pictures from camera No.2. 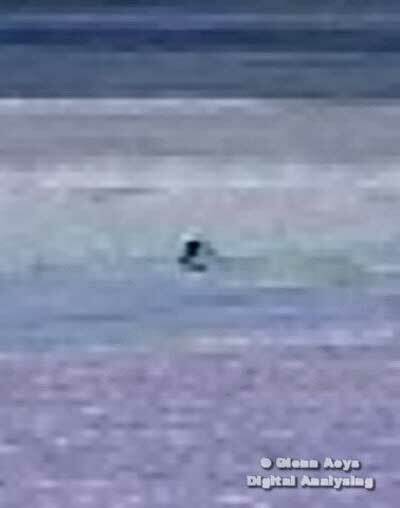 This camera had a much wider view and less resolution, but you can see, with no doubts, a white object moving over the crop field. Is there a conclusion to be made? What are we looking at? We are looking at the so-called Balls of Light, showing us their remarkable flying skills, form-changing from invisibility into visibility, objects decreasing in numbers and increasing in numbers - and that all in just 18 seconds! We have here unique recordings of the BOLs with date and time, even the seconds - and backed-up on a second film camera. I have the strange feeling that `they` knew they were being filmed. The objects are filmed perfectly in the middle of the camera lens. I also have the feeling that the discovery of the objects on the film was no coincidence.